What Is So Great About The Clark Hammocks ? In this technology-prone era, people want to make life as simple in order to have peace and tranquility. There are very few things in life, which give you type of peace as being out in the wilderness and enjoying Mother Nature. Having said that, when you find yourself out in the open, you want to make sure that you have the best in the equipment you will need, and out of those few elements, a Clark hammock always come on top of the list. Whether you’re at a beach side campfire or trekking, a Clark hammock will provide you with a higher level of satisfaction, no matter where you are and what you’re doing. 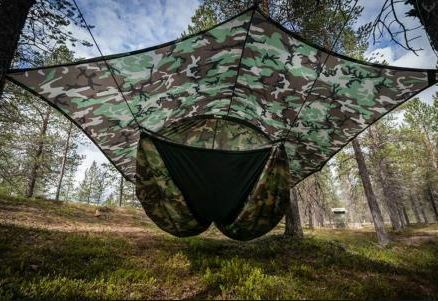 There are various advancements in the customization of the Clark Camo Hammock, most you may not have any idea of. For instance, are you aware of the different types? If not, the following section will give you enough of an idea about the Clark hammocks that are available. Finding the correct hammock is not as hard as it seems, as the only thing that matters is you and the outdoors. Some hammocks depend on nearby trees, and there are a few come as a stand alone. But, either way, a Clark hammock will surprise you with comfort, satisfaction and much needed relaxation. The Clark Camo Hammock is always regarded as the best choice by many who use them. They are flexible and don’t require much effort to install. The Sill-Nylon rain fly gives just about 100% cover from rain, which helps you to stay dry during the rains and actually helps protect you from the beating of the sun. The weather shield zips and netting help the air flow in easily and lets you enjoy the great outdoor air. The indoor storage areas offer enough room to put just about anything and keep the safe from the outside environment. The over-all comfortableness and protection that the Clark Camouflage hammock offers is well worth the price and will leave you extremely satisfied. Well, let us begin by introducing the man behind the creation of the Mark 2 hammock, Mr. Gary Clark. Gary Clark invented the modern camping hammock, and has created hammocks since 1967. He has introduced the lightweight hammocks to the passionate campers thereby making added comfort to their camping experience. One of his greatest inventions is the Mark 2 hybrid hammock which comes comes with 3-season protection and is known for its super comfortable interiors. It is the most stable and spacious hammock, and because of this, the Mark 2 hammock happens to be very roomy. It is rain safe and has a solo ground tent. There has been some upgrading of the Mark 2 hammock with the introduction of two interior pockets for storing your extra items. It has an extra-long bed and a more space in the interior so that it can accommodate your backpack too. There is an in-built tarp to provide you all-weather protection inside the hammock. The porous and breathable weather shield provides extra comfort inside the hammock. The elastic property of the tarpaulin provided helps the camper give extra area by spreading out the tarp in hanging position. The tarp can be easily removed when not required. However, the tarp does not create any inconvenience whether its zipped in or not. It comes with two poles of unequal length. The longer pole is placed in the head-end while the shorter one is placed in the tail-end or foot end. The longer ridge line clip is used when the hammock is set on the ground. The two stakes provided with the kit helps in winding the hammock strong with the ground. The use of finest qualities of no-see netting helps keep mosquitoes away as well as gives protection from the sun. Not only does it give a comfortable experience inside the hammock, but it also ensures a convenient and easy pack-away inside a small stuff sack. The stuff sack has room for all the accessories, i.e. the hammock, weather shield cover and the tarpaulin. For hanging purpose, there is a small ridge line clip that can be used. The super spacious Mark 2-hybrid hammocks is the best camping solution available in the market. It is indeed the best pack-in for your next outdoor camping trip. The cushioned and roomy interiors with extra pockets make it a great and comfortable thing to carry for your camp. So, if you are bag-packing for your next camping trip, trekking, outdoor adventure or on any outdoor vacation, then do not miss out on getting your favorite and comfortable Clark hammock that can give you great camping experience. It is attractive, affordable and handy. The Clark Mark-2 hybrid assures you to provide the finest quality of hammock that will make your camping experience a memorable one. Now that you’re ready to head out to your outdoor expedition, you should really consider the type of sleeping and weather prone product that you’ll be taking with you. The Clark NX-270 is known as one of the best hanging hammocks available in the market. It is one of few 4-season, large solo bed hammocks available for the outdoor geek. It’s spacious frame is unlike any other hammock and comes with sturdy and flexible fiberglass poles, test polypropylene rope and is a no-tip design. It offers a large 6-pocket storage under the hammock itself so it allows the camper to store things such as their hiking boot and gear during the night. You’ll also find 2 internal pockets, inside the hammock, so that you can store more personal belongings and not have to worry about someone taking it. Made with water-resistant and mosquito-resistant bed fabric, which gives you the best protection available. The Clark NX-270 comes with dual cold weather features that will surely make your life more enjoyable in the outdoors. First, the breathable Weather Shield zips in the hammock into an enclosed tent with powerful insulation that provides warmth and a windbreak to give extra protection from rain and snow. Second, the insulating pocket system helps keep the body warmer even in cold weather. This saves the need of an insulating pad even when camping below 32 degrees F (0 degree Celsius), although it is always recommended to purchase the insulating pad just for added protection. The excellent insulating properties, along with the wind and water- resistance material makes NX-270 hammock the best camping solution ever. The large super soft quilted bed with flexible poles creates a roomy and spacious place inside the hammock. It comes in four vibrant shades, and all the shades are duo-tinted with black. The attractive shades make it more colorful and vibrant for its users. The Clark NX-270 hammock model comes in a built-in stuff bag to pack away the entire hammock in a handy way, and carry it along the camp without much effort. The use of best quality material to make the hammock proves to be much advantageous for the campers as they can get a lifetime experience of camping through these comfortable hanging hammocks. So all the campers out there, backpack your camping trip and yeah, don’t forget to take your Clark NX-270 hanging hammock in order to experience a whole different level of camping. The hammock is undoubtedly a good- buy for every camper. The quality of material used in making the hammock and the spacious compartments, or pockets, speak about the comfort inside. It also comes with a pocket- friendly price so that it is affordable for the adventure enthusiasts to pack-in this hammock in their next trip. The availability of these hammocks in four different vibrant colors adds to its beauty.